Ararat Rural City Customer Service and Information Officer Marina Melenhorst, who will be running an information booth at the festival, joins Ararat Police Senior Sergeant Damian Ferrari and Ararat Rural Council’s Events Development and Marketing Officer Belinda Ryan and Tourism and Community Information Officer Tim McDougall. Ararat’s diversity will be celebrated at Alexandra Oval on Saturday, November 26 when the Viva Multicultural Festival makes a return. 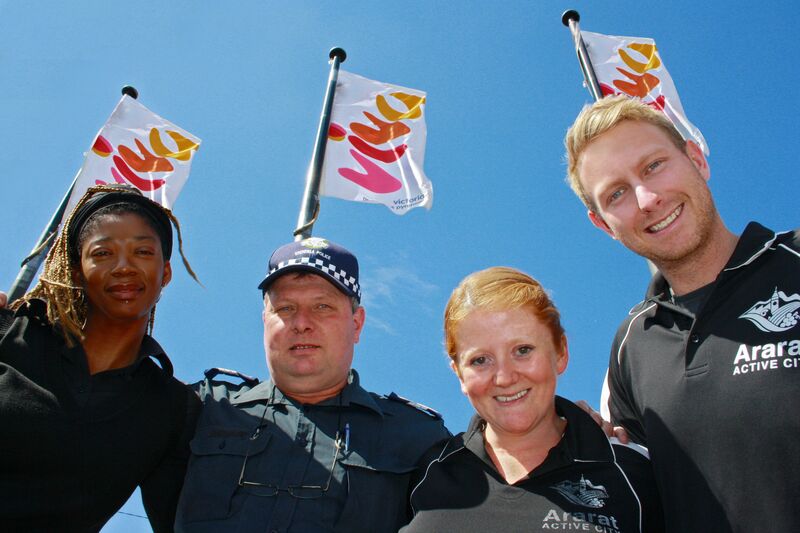 The festival returns to Ararat for the first time since 2013 and is a joint collaboration between the Ararat Rural City Council, Victoria Police and various local community groups. Originally scheduled for early October, the Viva Multicultural Festival was forced to be postponed due to heavy rain affecting Alexandra Oval’s surface. Ararat Rural City Council CEO Andrew Evans said the change of date hadn’t slowed momentum. “All food trucks, performers and information stalls that were booked for the October date will be returning on November 26 and it is exciting to see the Viva Festival back up and running,” he said. Mr Evans encouraged families to bring along a picnic rug to lay out on the oval and enjoy a wonderful spring night under the stars while family friendly movie Inside Out played. The movie is part of the Ararat Rural City Council’s Summer Cinema Series, which has already seen outdoor cinemas staged at Mount Cole. The Viva Multicultural Festival will kick off at 4pm with a variety of cuisine from around the globe available throughout the day. Entertainment will take place in a variety of shapes, with highlights including Ethiopian reggae group Nhatty Man and Gara, along with Africa performers from the Asanti Dance Theatre. Ararat Police Senior Sergeant Damian Ferrari said the day will be a celebration of Ararat’s multicultural community through food, activities, music, dance and performance. “The Viva Festival is a fantastic initiative and will go a long way in promoting understanding, acceptance and inclusion of different cultures and how we can work together to ensure this occurs,” he said. “The day will be a fantastic opportunity for the community to be involved in gaining some additional understanding of differing cultures and enjoy an array of different foods from varying cultures. For further information regarding the 2016 Viva Multicultural Festival contact Ararat Rural City Council Event Development and Marketing Officer, Belinda Ryan on 5355 0272.